EXSA-CRM---Start-your-free-trial-now - Benchmark Community EXSA CRM - Start your free trial now! Having problems monitoring your sales account? Is your business forecast not visible? Start your free EXSA Cloud CRM trial today! EXSA Cloud CRM is a system that will allow you to do your tasks from the beginning to end. It streamlines your business process such as sales, marketing, customer relations, and inventory in single platform. What's good with EXSA is you can easily see the Sales Pipeline, Forecast, Commit, and Closed Account on the dashboard. Plus you will be able to see where your leads is coming from. 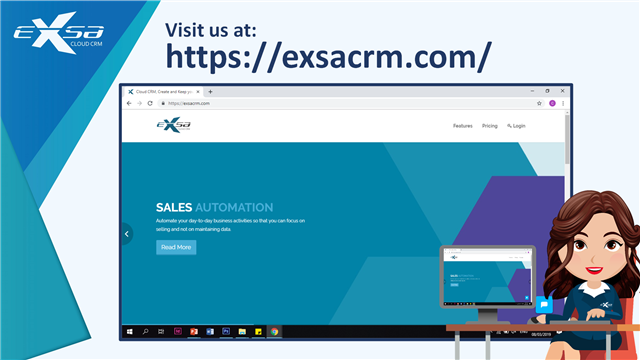 Let EXSA Cloud CRM be your sales companion! You are receiving this email because of your relationship with VBusiness Software and Solutions Inc.. Please reconfirm your interest in receiving emails from us. If you do not wish to receive any more emails, you can unsubscribe here.